The Astros will play in the AL West this year. Once you get over your mind being blown, get a grip and understand that the AL has had baseball before the Astros arrived. I know, I'm baffled. The teams have histories and multiple uniforms including St. Patrick's days greenies. The exception being the Oakland A's. They always wear green. I assume to honor the late St. Patrick. Let's learn more about them. 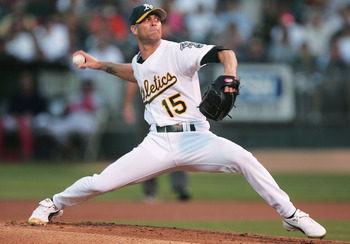 Before I go any further I want to say, the A's wear white shoes. I thought this was the coolest things about the A's in the 80's growing up. I was right. White shoes are the bomb. The Astros used to wear white shoes until they rebranded themselves and RUINED IT! Go back to white shoes Astros. You know you want to. Behold the glory of white shoes. You and possible your wife have watched Moneyball. Brad Pitt was in it. 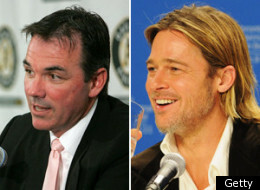 He played Billy Beane, the A's general manager. It was nominated for an Oscar and Jonah Hill played a guy who was supposed to be Paul Dipodesta, but wasn't named Paul Dipodesta. Confused. Don't be. Also don't read Moneyball the book. Let me sum it up. Hire an economist genius to do stats for you, he'll tell you to sign certain players based on OBP and WHIP and WAR, sign those guys and you've built a championship contender. There, I saved 300 pages of your time. You're welcome. While we're at it, you know what was left out of that movie, Moneyball? Mark Moulder, Tim Hudson, and Barry Zito. Give me those guys in their prime and yeah, I can make David Justice and Scott Hatteberg look really good. That A's started in Philly in the 1860's, moved to Kansas City in the 50's and Oakland in the 60's. They were owned by Charlie Finley in the 60's and 70's. He introduced ball girls. He also offered bonuses for growing a mustache. We fully support this. 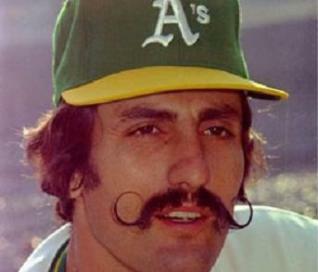 Without Charlie Finley we may have never known the wonder of Rollie Fingers' soup strainer. He also hired MC Hammer aka Stanley Burrell as his special assistant. Mustache bonuses. We can get behind that. The A's have nine world series titles, the last of which came in 1989 when the Bash Brothers were 'roiding up the big leagues. They are your DEFENDING AL WEST CHAMPIONS having caught the bit after the Rangers spit it last season. The A's want to move out of the old Oakland Coliseum and are flirting with moving to San Jose in the near future. The San Jose A's how does that sound? No one cares. Just keep wearing white shoes and not spending any money. Who are these guys? Seriously. Astros fans will remember Jed Lowery from his epic 2012. Or not. Yeonis Cespedes patrols center field, he's a Cuban defector with big upside other than that, they have CoCo Crisp and 23 guys you've never heard of unless your a baseball fan, in which case, you've only heard of 9 of these guys. How did they win the AL West last year? They got hot in August and watched the Rangers backpedal towards them. They also harnessed something called the Bernie Dance. I'm posting a video. You'll never get this time back. So where's the hate? CJ Wilson makes it easy to hate the Angels. Can you make fun of the A's because they're poor? Not with the Astros payroll. Not a lot you can do in terms of hate. Just know that the A's can't be that good for that long because they live on a budget even with their cool white shoes. Posted on April 1, 2013 by The Roundup and filed under Sports and tagged AL West Oakland A's Charlie Finley Rollie Fingers Moneyball.